Liverpool Catholic Cathedral, or the Metropolitan Cathedral Church of Christ the King to be precise, is the seat of the Archbishop of Liverpool and the religious home to Liverpool’s significant Roman Catholic population. Liverpool was the primary port for transport of goods and people to America during the 19th Century and the location for the start of the emigration journey of many from Ireland. At this time, Ireland was in a terrible state, the Irish potato famine killed nearly a million people that were already suffering massive hardship and living in a state of poverty. 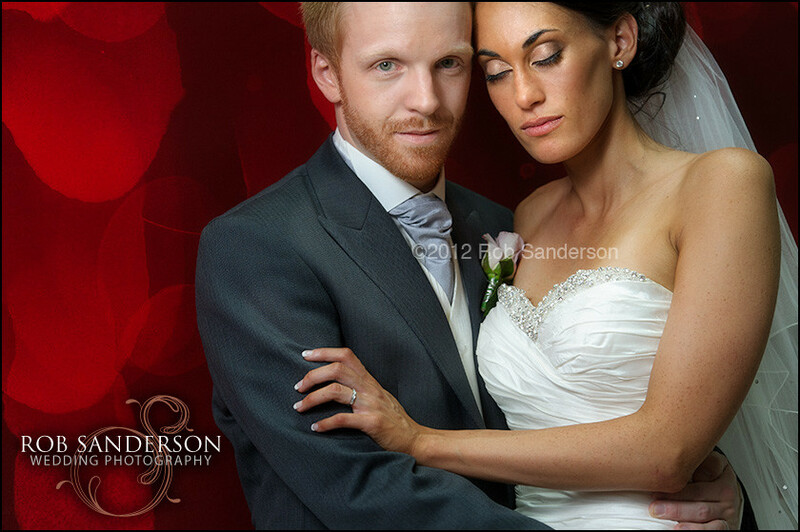 Their escape was to emigrate, primarily to America but many stopped at the growing and prosperous city of Liverpool to find work and escape the incredibly poor standards of living that were typical in Ireland during this troubled time. In recognition of the growing catholic population in the city, a new cathedral was commissioned in 1853 to Edward Welby Pugin. In 1856 the Lady Chapel or the ‘church inside the chapel’ was completed but here the work ended and the often troubled history of the Liverpool Catholic Cathedral began. The original building was never progressed due to lack of funds and failed to achieve the aim set out. In 1933, the anglican Sir Edwin Lutyens design was commissioned and work began on the existing replacement cathedral to compete with the existing Liverpool Cathedral of the Anglican church designed by the Roman Catholic Giles Gilbert Scott! The Lutyens design was extremely grand with a huge dome based on St Peter’s Basilica in Rome, but work stopped when the crypt was completed due to the rising costs, the second world war and a lack of new money to pay for the grandiose designs. Construction eventually began again on the new designs of Sir Fredderick Gibberd in 1962 and was completed in 1967. The Gibberd design incorporated the premise and conception of the Lutyens design but was completely modern using the latest materials in the construction, but was also mired by significant flaws within the design, construction and materials. 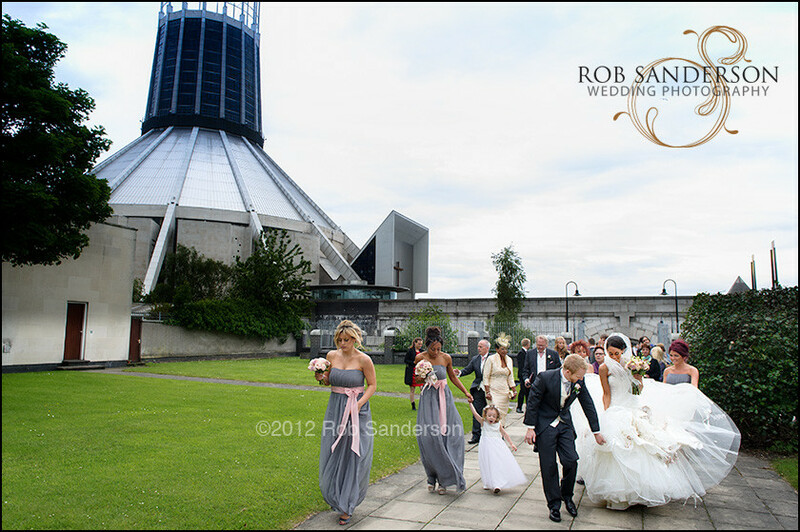 The 1990s then saw a complete renovation of the cathedral to resolve the spiraling structural issues and poor quality in the construction to once and for all, provide a place of worship for the Roman Catholics of Liverpool that they could be really proud of and a great photo location shoot for a wedding photographer in Liverpool. 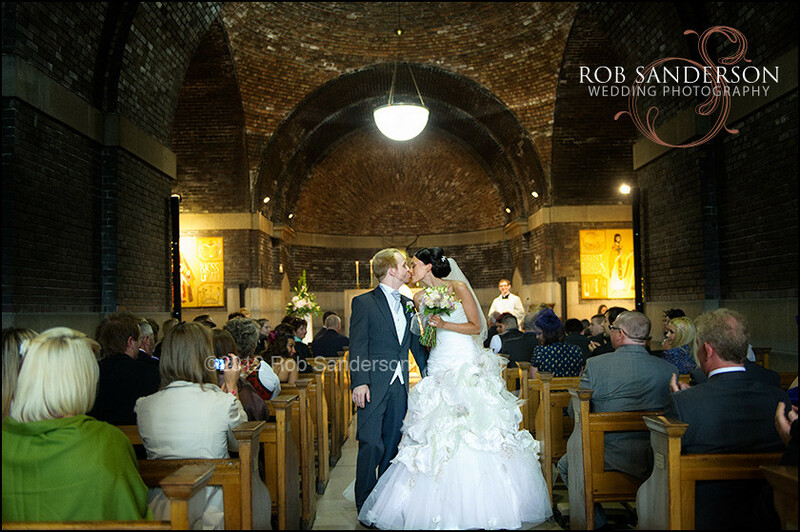 As you may have guessed, I love both of the fantastic cathedrals in Liverpool and I think that the city should be extremely proud to have two fantastic places to worship at and get married. 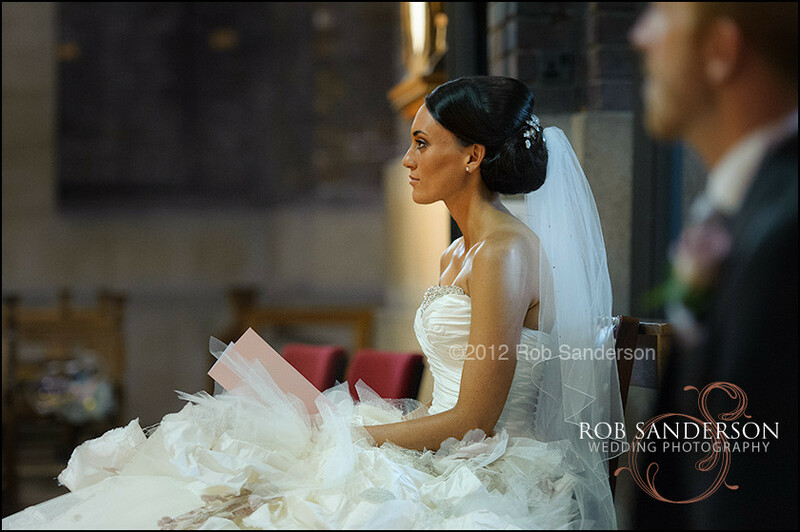 I love the Roman Catholic Cathedral of Liverpool for wedding photography because it is so unique, it really is completely different from any other large place of worship. The main area of the cathedral is surrounded by benches concentric with the interior. 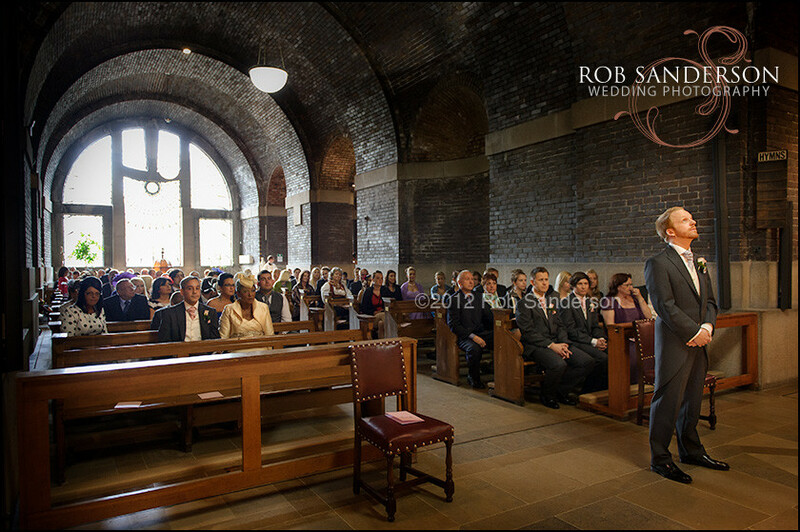 This gives a vast space so that all of the guests can see the wedding from every angle and provides a classic setting for a wedding photographer at Liverpool Catholic Cathedral. 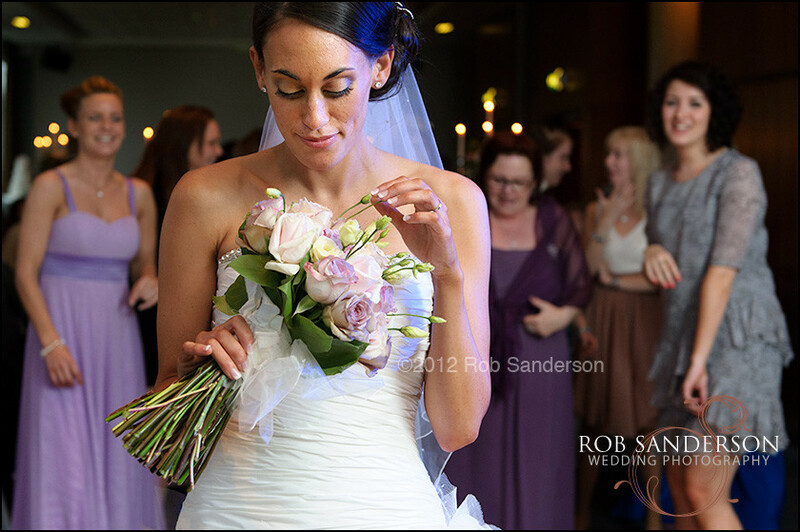 The opportunity to capture the entire audience in full rarely exists at many churches and this is a cathedral that is completely open so that the images really do pick up every little detail. 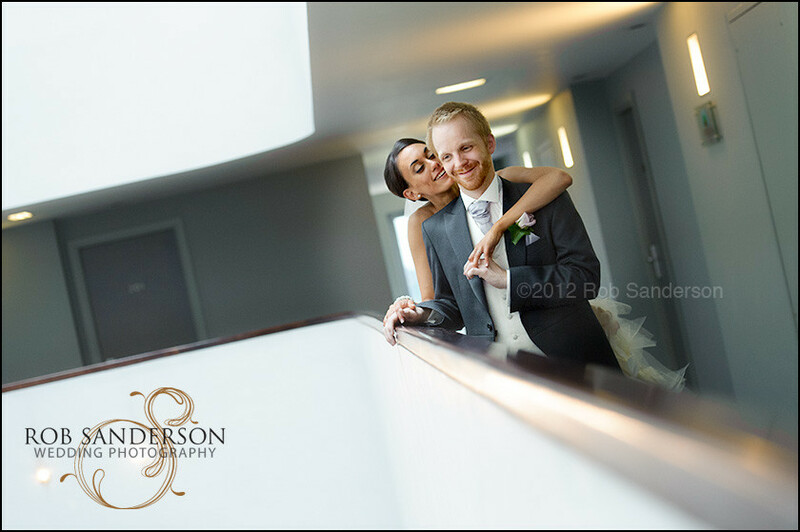 The lighting is also fantastic, being a modern cathedral, this poses some great questions for a photographer and in order to capture the perfect images, you really do have to be on your game here. 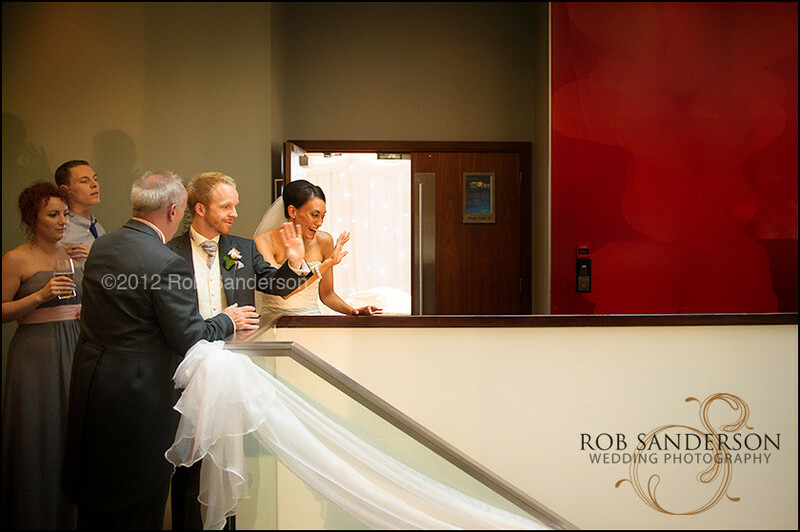 Due to the nature of the architecture, there are a vast array of different angles so that at every wedding, we can capture wedding photographs at Liverpool Catholic Cathedral that are completely unique to the bride and groom. 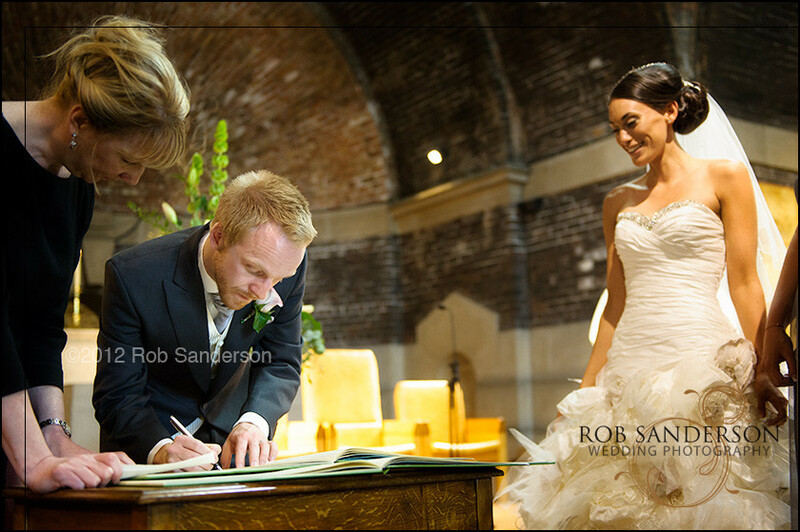 Rob is a local Liverpool wedding photographer and loves taking wedding photography at Liverpool Catholic Cathedral. 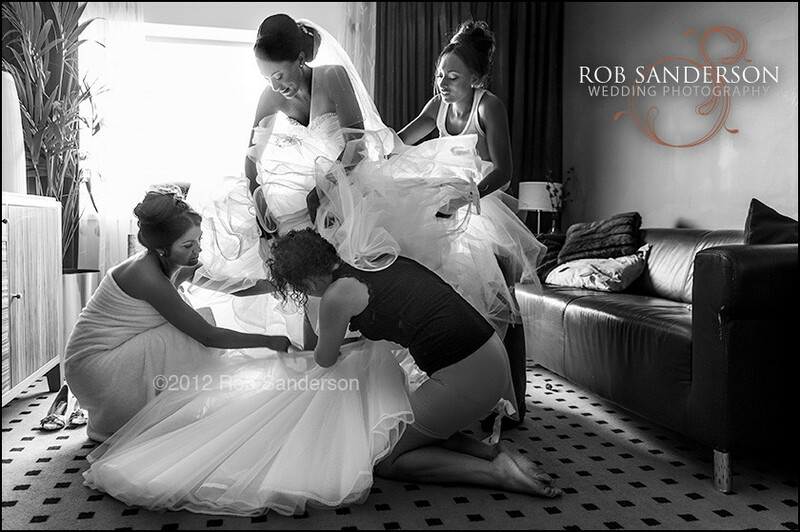 Rob has captured many weddings at virtually all of the best wedding venues in Liverpool including Liverpool Town Hall weddings and St Georges Hall weddings. 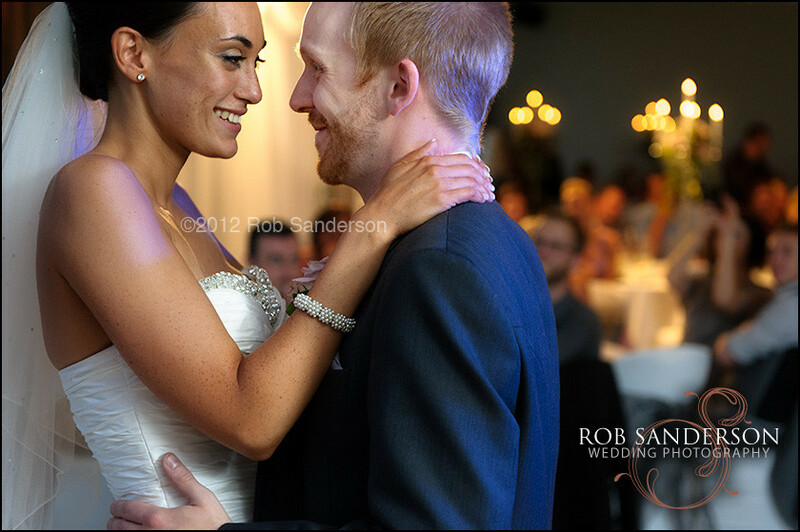 If you would like to see images, click on the link to Palm House wedding images or Knowsley Hall wedding photographs and the Hillbark Hotel weddings in the Wirral so that you can get an idea of our wedding photography style.